There are currently two popular interrelated narratives on social media surrounding participation of the block making process on a public blockchain. The stories are most pronounced within the Bitcoin community but are also reused by Litecoin, Ethereum and other cryptocurrencies too. This post looks at both of these and show that in practice neither is really true as of April 2016. A year ago I reflected on some of the debate surrounding permissioned and permissionless blockchains. Part of that post involved looking at how the mining market actually evolved in practice; not just based on the generalized claims made by enthusiasts at conferences. Recall that even though it didn’t initially sign coinbase transactions, Slush began publicly operating at the end of November 2010. Eligius was announced on April 27, 2011. DeepBit publicly launched on February 26, 2011 and at one point was the most popular pool, reaching for a short period in July 2011, more than 50% of the network hashrate. While many enthusiasts claim that “anyone can mine,” in practice, very few choose to for a number of reasons that will be discussed below. But more to the point, the reason cryptocurrencies allegedly have a “permissionless” characteristic in the first place has to do exclusively with the fact that there is no administrative gating or vetting process for allowing actors on the network to participate in the block making process. In 2009 there was no whitelist, blacklist, KYC or KYM (know your miner) process. It is not related to developing other platforms that plug into the network. It is not related to whether the network codebase is open source or not. It is not related to being able to build software products that somehow utilize the network. It is not related to being able to view or not view transactions. Yet due to how the market evolved, today in 2016 while everyone is still paying for the high marginal costs to maintain a network designed for pseudonymous and anonymous interaction, few participants, specifically block makers, are actually capitalizing off of that utility. (2) The other main mechanism for vetting miners now is through the use of data science itself. Roughly 10 companies globally provide law enforcement, compliance teams and regulators access to relatively robust analytics tools to track provenance of bitcoins (or other cryptocurrencies) back to coin generation itself. And in order to sell these mined bitcoins (e.g., to pay for the electricity and the mining hardware), nearly every bitcoin conversion to fiat marketplace now requires some compliance of local KYC and AML regulations. While there are workarounds such as LocalBitcoins and SharedCoin, generally speaking the pseudonymous network itself in 2016 has largely become doxxed. Yet the high costs of maintaining pseudonymity, via proof-of-work, still remain. What about beyond 4 days? Above is the pool distribution of the past year based on coinbase data aggregated by Blocktrail. 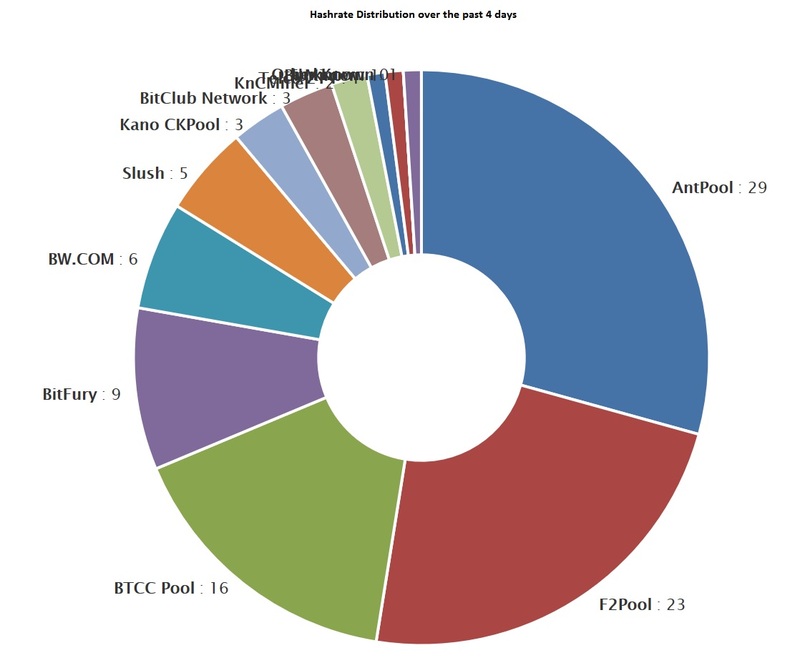 The 10 largest pools collectively account for roughly 91.6% of all block making activity. There is also a relatively long tail that includes roughly another 60 entities (some of whom do sign coinbase transactions) that represent the remaining 8.4% of all block making the past year. Why do any actors sign transactions at all, after all, isn’t a core characteristic of a public blockchain pseudonymous consensus? To my knowledge, no one has formally published a thorough explanation for the reasons why. But one repeated rationale is that pools do so in order to prove to the miners (hashers) connected to the pool what the provenance of the block reward income is. For those who have never partaken in the mining process before, a quick history lesson: within the first two years of Bitcoin’s existence a division of labor arose in which block making became separated from hashing itself (e.g., generating proofs-of-work). Today, if average Joe buys ASIC mining equipment, he typically does not connect them to his own pool but instead connects them to a pool run by Bob the devops professional.6 And how can Joe trust Bob not to shave off pennies from each share of work that Joe submits? Block signing in theory provides some semblance of transparency: letting the hashers know if pool operators are skimming off the proceeds by not accurately reporting blocks found (e.g., income). Why doesn’t everyone become a block maker, after all, the process is billed as being “open” to all? There are multiple reasons why, but the most important reason boils down to economics. Dave Hudson has written about 10 different articles on the baked-in variance (inhomogenous Poisson process) that motivates individuals to continually pool their mining effort versus solo mine.9 Spoiler alert: you are likely to be struck by lightning before you will ever create a block and reap a block reward by solo mining off of your laptop at home. Other reasons for why few decide to become block-makers include: the added costs of providing DOS protection to your pool and the need to hire competent staff that can prevent and be on the lookout for problems like BGP hijacking which results in lost revenue. This has not changed for multiple years and will likely not change for reasons discussed below. With the upcoming Bitcoin block reward halving that is expected to take place in mid-July, there is a growing chorus of ‘hope’ that it will somehow lead to fewer large mining farms and pools. This probably won’t occur for several simple reasons, namely due to economic incentives. Recall that the major reasons why mining activity itself has gravitated to locations such as China isn’t due to conspiracy theories involving lizards but instead ancillary costs. close personal connections with hardware manufacturers and fabrication plants in China and Taiwan; acquiring hardware for mining cryptocurrencies is just as relationship driven as other specialized non-commoditized industries. Because medium and large miners know who the chip design teams are and what the ASIC roadmaps will be, they can stand in line at the front and acquire hardware before others. What will happen after a block reward halving? Just as oil producers with the highest marginal costs have been forced to exit the fracking market over the past couple of years, Bitcoin miners with the thinnest margins will likely exit the market immediately. What this actually results in, at least the short run, is a more concentrated group of larger hashing farms and pools. Because miners as a whole are effectively being given a 50% pay cut to provide the same utility as before. And ceteris paribus, if Alice doesn’t currently have thick 50% margins, then she will likely exit the market. In contrast, some of the most profitable miners in China and Republic of Georgia are now operating — even with the large difficulty rise over the past 6 months — with 50+% margins. They may be squeezed, but they do not have to exit the market. Basically, the less efficient players will be squeezed out and the more efficient players will remain. Who is likely be be more efficient? Larger farms in cheaper locations, or smaller pools made up of less sophisticated players with less capital? But if the price of cryptocurrencies rise — in this case bitcoins — then won’t former miners come back into the market? Maybe, but recall, we have seen this song and dance before and it is likely that the block reward halving is already factored into both the current market price and the hardware replacement cycle and as a result there probably will not be a doubling of the market price of bitcoins. However, that is a topic for a different post. What do mining pool distributions look like for other cryptocurrencies? Above is the distribution of mining pools for Litecoin over the past day. 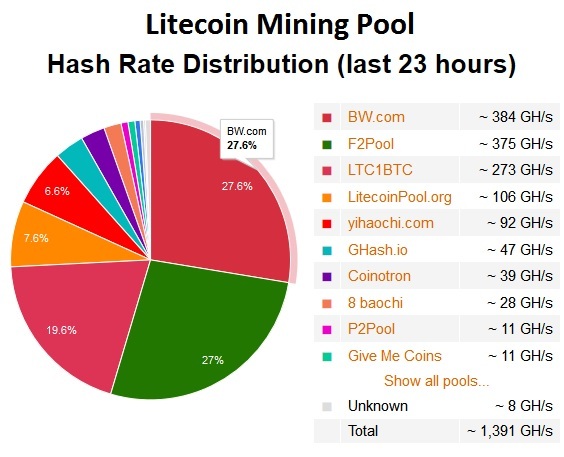 Interestingly, Coinotron — a pool I used when mining 3 years ago — currently represents 2.8% of the block making during that time frame. Two years ago, in May 2014, it represented about 50%. 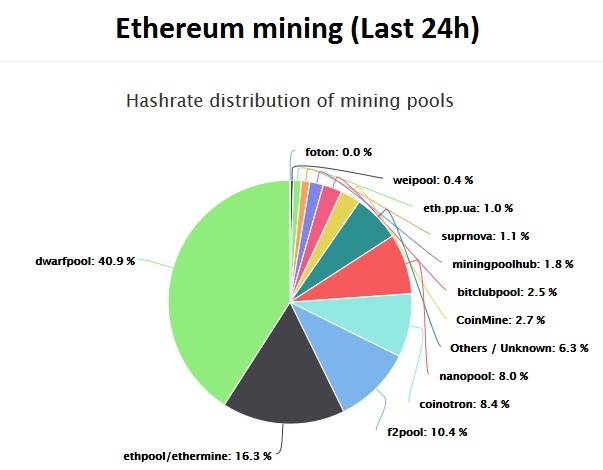 Above is the distribution of mining pools for Ethereum over the past day. Interestingly Ethereum formally launched in August 2015 and has seen the same consistent pattern of 3-4 pools representing the majority of block making activity as other cryptocurrencies have witnessed. In fact, Dwarfpool, despite its name, has flirted with the 50% threshold several times, most notably in March. The Ethereum development team plans to transition the network from proof-of-work to proof-of-stake (Casper) later this year; it is unclear if the “staking” process will result in similar centralization. Other cryptocurrencies continue to face similar pool centralization. This includes Namecoin which last year saw one pool, F2Pool provide more than 50% of the network hashrate for multiple months. While it does not appear that F2Pool behaved maliciously, the fact that one block maker could potentially rewrite history by doing block reorgs motivated Onename to migrate away from Namecoin. It is surprising that with the 60%+ hashrate located in China that there is scant detail in English about how that ecosystem works. But there are reasons for this. Recall that based on the current 25 BTC block reward, roughly $450 million in mining rewards has been divvied out over the past year to miners. On paper that would mean that China-based miners received more than $270 million in revenue, which cements this industry as one of two that continually see large annual revenue flows (the second being exchanges themselves). I contacted a mining operator in China that currently operates about 40 petahashes per second in equipment. Note: miners use the abbreviated term ‘P’ and ‘PH’ to denote petahashes per second. This type of self-doxxing, quasi-dynamic environment has led to another interesting phenomenon: ad hoc customer service via social media. For example, two days ago, a user sent approximately 291.2409 bitcoins as a mining “fee.”13 A small pool called BitClub Network built the block that included this fee. This fee is equivalent to about $136,000. The community as a whole then began a crowdsourced investigation into who may have sent this fee and the motivations for doing so, with many believing it to be a mistake. After all they reasoned, a typical “fee” that most mining pools require in order to be included in the next block is usually less than 25 cents on most days. A user affiliated with BitClub has since publicly stated it would like to return the fee to the original entity that sent it, though it is unclear if he is speaking with any authority or if the whole thing was a ruse to begin with. But, as I have argued before, this not only sets a bad precedent for miners as a whole due to a loss of revenue from the forthcoming ‘halvening,’ but the ability to contact a block maker sets a dangerous precedent for the core utility of the network: the disappearance of pseudonymous consensus. Comment from discussion mustyoshi’s comment from discussion "Hey @BitClub_Network. Will you do the right thing? The entire community is watching. Your chance to demonstrate your principles -@aantonop". Or in other words, if block making was actually pseudoymous and decentralized, with 100+ unidentified pools creating blocks each day, it would be difficult if not impossible to locate and provide timely customer service to a user who made a mistake. For instance, the most well-known block reorg occurred in March 2013 and it was only resolved when miners, including Slush and BTCGuild, contacted and coordinated with one another via IRC. If the network was more decentralized and pseudonymous, this coordination would have been very difficult to do, and this was by design. I pointed out this irony on Twitter earlier this week as well: that there are trade-offs with this approach and the downside of using a bearer asset-based system that had no service level agreement, no EULA, no terms of service results in a world in which users who make mistakes have to complain on social media and hope someone is charitable. And this happens on a regular basis: earlier this month a user accidentally sent 13.65 bitcoins to the BTCC pool and used reddit as his customer service forum. That type of friction is not what most consumers want.14 It is a poor user experience which has gradually led to the creation of ‘trusted’ intermediaries in this ecosystem which as described in previous posts, recreates the existing financial system but without the same level of oversight and financial controls. The cryptocurrency community is learning the hard way why intermediaries exist, why SLAs exist, why legal identities are required for financial transactions, why consumer protection laws arose and so forth. Pointing out these patterns is not malice or due to a lack of understanding of how cryptocurrencies work, but rather it serves as illustrations for why it has been hard to find real sustainable traction in the space. How else is this visualized? 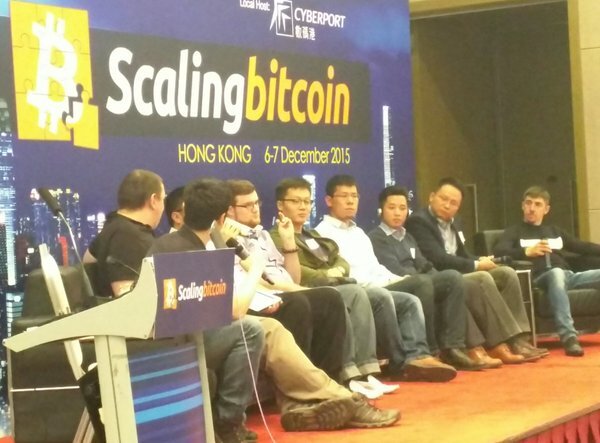 One of the sessions involved a panel comprised of the world’s largest mining farm and pool operators. The individuals in the photo above allegedly represent about 90% of the network hashrate. Thus, for all the hype around “trust anchors” tied into public blockchains such as Bitcoin, claims of decentralization and “trust-lessness” are empirically untrue. In practice, due to centralization and identity leakage, the cost to successfully reorganize a block isn’t through a Maginot Line attack (e.g., via hashrate), but through cheaper out-of-band attacks, such as hosting events in which self-doxxed miners participate. But that is also a topic for a different post. 16 months ago, Vitalik Buterin and others jokingly quipped that the trends towards centralization in Bitcoin mining (and other cryptocurrencies) resulted in a world where each coinbase transaction effectively arose from a multisig process. 10 is roughly the amount of quasi-permanent block makers in a given day. And $600 million was the amount of revenue that miners received at that time due to the higher market value of bitcoin. In theory, anyone can turn on their computer and hope to become a block maker on a public blockchain — no one has to register with a “Blockchain Admin” because there is no admin. However, in practice it requires a certain amount of technical knowledge and more importantly, capital, to profitably and sustainably operate a mining farm and pool. And in order to scale this profitably, in practice, most miners at some point reveal their legal identities thereby negating the core characteristic of a public blockchain: pseudonymity. How? Miners, after having erected purpose-built facilities or to liquidate their holdings, may be required by external authorities to go through a gating / vetting process (such as KYC). Ironically, a substantial increase in cryptocurrency prices may inevitably result in self-doxxing of all major farms. How? As market prices increase, miners in turn expend more capital to increase their own hashrate to chase the seigniorage rents. Because of the KYC requirements of utilizing resources like electricity at a hydroelectric dam and the subsequent identity leakage, this turns the block making process itself into a mostly known, permissioned activity. Consequently, based on this past history, the term DMMS should probably be qualified with a “quasi” modifier in the front: QDMMS. Furthermore, semiconductor engineering itself is effectively on a known, mature trajectory and which appears to be lacking any significant leaps in technological improvement. The largest entities, such as Intel, see this relatively static path which is one of the reasons why they have formally abandoned their tick-tock roadmap and now plan to lay off 12,000 people. In contrast, energy prices, land prices, labor costs and taxes are among other major components that professional mining operators look at as a whole and decide whether to stay in a market or not. Even if there is some price increase after the halvening, home mining by amateurs outside of China will likely continue to remain unprofitable after July. Sarcasm aside, despite copious amounts of news coverage, interviews and conferences, very few VC-backed cryptocurrency-related startups are divulging any non-gamable numbers. I had hoped to do a regular quarterly update (see previous January post regarding usage numbers) but there just isn’t much public data to go on. In fact, there is less data today than 3 months ago. Over the next year or so, you’ll see the Coinbase brand shift from being a hybrid wallet/exchange to focusing on purely being a retail and institutional exchange. It will take some time to update, but the transition will happen. Currently, 80% of Coinbase’s customers buy bitcoin as an investment, and 20% transact with it, though that balance is currently shifting more toward transactions. Perhaps transaction volume overall is increasing, but if so, why remove the wallet transaction volume chart? Or is it solely related to transaction volume on the exchange? “Startups play a pretty integral role in the sense that we represent most of the end. If you look at users of Bitcoin on the network, most of them are represented by one of the major Bitcoin companies,” says Peter Smith, chief executive of Blockchain, adding that five or six companies, including Coinbase and Blockchain, represent about 80% of transaction volume on the network. Numerous startups are also using Bitcoin to enable their users to more easily send remittances, cross-border payments and peer-to-peer payments, as well as make mobile in-app purchases. 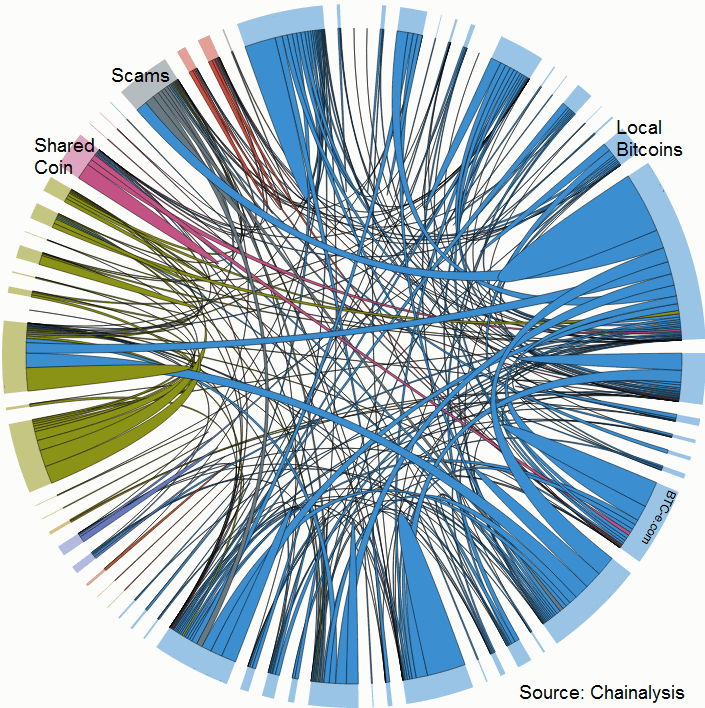 Maybe this is true, maybe there are 5 or 6 companies that represent the lionshare of volume on the Bitcoin network itself. If so, we should be able to see that. This is a simplified, color coded version of a tool that Chainalysis provides to its customers such as compliance teams at exchanges. The thickness of a band accurately represents the volume of that corridor, it is drawn to scale. The names of certain entities are redacted. The image is based on data for the first quarter of 2016 and is an update to the chart I published in an article back in January. Based on the chart above, there are in fact 5-6 organizations that represent 80% of the volume; both Coinbase and Blockchain.info are among them (Blockchain.info also operates SharedCoin). In fact, Chainalysis recently updated their methodology and found that Coinbase transactions represent every 6th or 7th transaction on the Bitcoin blockchain. 2 This specific area of data science is continuously undergoing refinement and should be looked at once again in the coming months. The same Forbes article says that Coinbase has 3.5 million users and Blockchain.info has 6.5 million wallet holders. Where can we find data that is still be published and could reflect usage numbers of public blockchains? As shown above, over the past month, the amount of bitcoins stored using P2SH addresses increased from 9.99% to 11.7%. A large noticeable pop took place two weeks ago and some speculated that it could be a Liquid-related multi-sig movement. OP_RETURN has also seen increased usage. Above is a chart measuring the past 15 months of usage. As described in Watermarked Tokens, OP_RETURN is an opcode in Bitcoin’s scripting language that is commonly used by colored coin projects. Two of the five are colored coin-specific projects and all five cumulatively account for about 76% of all OP_RETURN usage. Looking at the previous charts from January, the ‘Bitcoin Distribution by Address at Block 400,000‘ looks roughly the same as the distribution at a block height of 390,000. According to CoinATMRadar, the ‘number of Bitcoin ATMs installed by Bitcoin machine type’ increased from 536 at the beginning of January to 612 at the end of March. This comes to roughly 0.84 ATMs installed per day or a rate slightly higher than the past 2 years (it is on pace for 308.2 installations altogether this year compared with 275 per year for 2014 and 2015). And activity on both BitWage and Blockchain.info wallets looks roughly the same as they did in January. Some venture funding bounced back from the dearth in Q4 2015. According to the venture capital aggregation at CoinDesk there was $148 million of publicly announced rounds for both Bitcoin-related and Blockchain-related startups spread among 14 deals in Q1 2016. Though two investments alone (DAH and Blockstream) accounted for more than two-thirds of that funding tranche. However, the list is probably not complete as two investments into Kraken’s Japanese subsidiary were for undisclosed amounts (first from SBI in January and then by Money Partners Group in March). Similarly, Ripple also received capital from SBI in January (for a reported 3 billion yen or ~$25 million). In addition, last week, CB Insights (a venture tracking firm) held a webinar that covered the “Bitcoin / Blockchain” ecosystem (deck) (recording). For instance, Tradeblock recently launched Axoni (a private / permissioned blockchain) and Peernova isn’t really a “Blockchain” company now. 11 The webinar is a little outdated on the cryptocurrency side of things too. For example, Mirror is completely out of the ecosystem altogether, 21inc is basically a software company at this point, Buttercoin is bankrupt and Blockscore shouldn’t be included in either bucket. I would be remiss to not include Counterparty, a platform has effectively plateaued (see image above) and has now been eclipsed by Ethereum based on multiple measurements including transaction growth (which actually may be eventually be gamed via “long chains” just like some Bitcoin transactions are). What kind of other metrics are available? Ignoring the liquidity and market cap sections (basically all cryptocurrencies are illiquid and easily manipulable) there is a marked difference in terms of terms of social media engagement and interest between the two platforms. For example, in terms of public interest, one measure that could be added to the Coingecko list is the amount of organized Meetup’s: Ethereum has roughly a hundred globally and Counterparty has about 10. As an aside, I attended two Ethereum meetup’s last month: one hosted by Coinbase in San Francisco and another one hosted by IFTF in Palo Alto. Both were well-attended with roughly 120 people showing up for the latter. Why is no one actively publishing numbers? It could be the case that some of the startups feel that any user / usage number is commercially important and therefore treat it like a trade secret. Is there really less transparency in this market compared to other tech markets? Maybe, maybe not. What about public markets? Last spring, Blizzard Entertainment announced it would no longer publish World of Warcraft subscription numbers. This was done because of the continual decline in subscriptions (more than halving from its 12 million peak). Similarly, last fall, Microsoft said it would no longer publish Xbox One unit sales and would instead share Xbox Live usership. ((Disclosure: I own an Xbox One)) At the time this move was seen as a way to downplay the growing gap in sales between Sony’s PS4 and the Xbox One. Back to the public blockchain sphere: why would 40+ companies that have closed a Series A or higher as a whole decide not to publish user / usage numbers in a market that claims to always be growing by leaps and bounds? 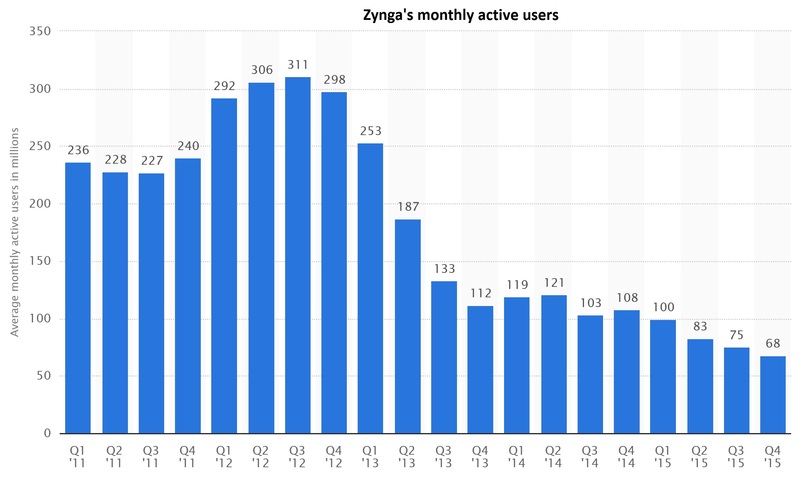 One of the problems appears to be that when you raise a lot of money, $50+ million for B2C applications your charts are expected to look a bit like other high-growth companies. 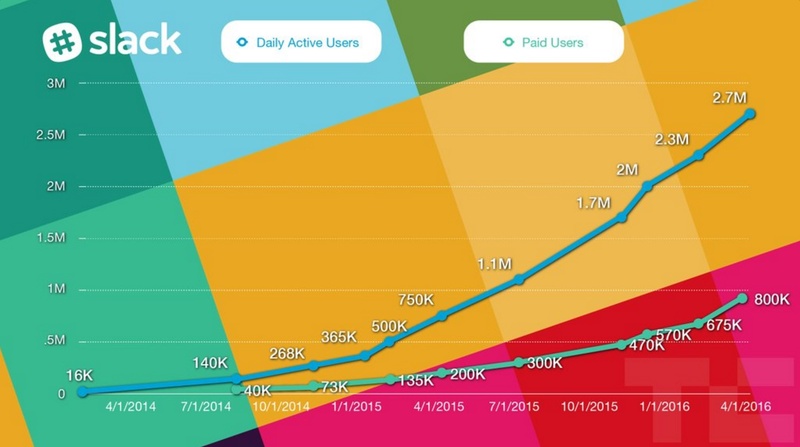 For instance, above is a two-year chart displaying two types of users: daily active and paid for Slack. With 3.5x daily user growth over the past year, Slack announced last week that it has closed its new round, raising $200 million at $3.8 billion post-money valuation. About a third of its daily users which are paid users, a relatively high conversion rate. Obviously social media commenters will point out that “cryptocurrencies” are not the same thing as communication tools, but the point remains that eventually the aspirations of investors will re-calibrate with the actual growth trajectories of a platform. And as of right now, based on public data it is unclear where that traction is in the cryptocurrency world — perhaps it does exist somewhere but no one is publicly revealing those stats. Where is the growth, where are the numbers? Those are the two questions that continue to drive blog posts on this site. Perhaps startups in the public blockchain ecosystem will be more forthcoming later this year as more capital is deployed. We will try to revisit this topic once more information is publicly available. It will also be interesting to see how many more cryptocurrency-related companies rebrand or pivot into the “private blockchain” sphere without actually changing how they interact with cryptocurrencies. Thus, my older October post on the Great Pivot should be revisited at some point as well. In addition, if “private blockchain” platforms are eventually flipped on into production mode, they may begin to yield usage numbers worth looking at in a year or so. Since then, the paper and portions thereof, have been translated into multiple languages, emailed and downloaded thousands of times, copied word-for-word by many consulting companies and used as a primer for managers and executives at organizations big and small. In short, it helped articulate what was then happening in a new niche industry, one that has grown over the subsequent months. What has changed and why did it become popular to the point where vendors now use bullet points marketing their product as a “permissioned ledger”? Hyper (Hyperledger): in June 2015 they announced they had been acquired by DAH. 3 Its namebrand was then donated to the Linux Foundation; see What is the difference between Hyperledger and Hyperledger? Ripple (Labs): in October 2015 they announced that their Series A had closed at $32 million in funding with the inclusion of Santander. In January 2016 additional funding from SBI Holdings into Ripple’s Japanese subsidiary was also announced. Tillit: rebranded as Ldger and is currently focused on market place lending and structured products; no longer uses Ripple. What about the rest of the marketplace? Altogether, since September 2015, at R3 we have been approached or pitched by around 150 vendors of all shapes and sizes who do something orthogonally related to distributed ledgers. By and large, most of them are uninvolved with cryptocurrencies themselves: that ship seems to have sailed with the Great Pivot. Perhaps that will change again? What has resonated with people, especially financial institutions regarding this new market? Part of it for sure is related to hype. Distributed ledgers and blockchains have been sold as silver bullets and panaceas to all the worlds ills. This exuberance will likely lead to another washout cycle which has happened in many other tech segments (most notably cleantech). Another reason is that as articulated in Appendix B, while there was latent interest in the cryptographic toolkit utilized by Ethereum and Bitcoin, managers were finally afforded an explanation as to why something like proof-of-work is purposefully expensive and why it is unneeded and undesirable in an environment in which trusted intermediaries with legal contracts already operate in (e.g., capital markets). While they are not the only entities experimenting with blockchains, regulated financial institutions have also spent the past year looking at the consequences of using pseudonymous consensus methods, discovering that platforms like Bitcoin fundamentally lack definitive settlement finality which was briefly discussed on page 22 and 23 in CaaS. This was supposed to be a brief post so we have to pass on dovetailing into the myriad of other interesting changes in the landscape. Regular readers may have noticed just a few posts on this site over the past few months. Why? Part of this is because the content I do write is typically sent to R3 members only. Even though the capital markets have largely settled on a specific class of ledger — one that is integrated with the existing legal system without any type of cryptocurrency or proof-of-work — the debate around public versus private blockchains will likely continue into the year by enthusiasts. For those involved in regulated capital markets who are looking at solutions to problems with a set of requirements involving post-trade activities of clearing and settlement, it is worth pointing out that yesterday Richard Brown unveiled the project he has been working on the past 7 months: Corda. A year from now the distributed ledger landscape will likely look a lot different than what it did in 2016 let alone 2015. It will be interesting to see how many projects are still replicating and reusing older “blockchain” designs versus building systems that are fit-for-purpose like Corda. Following up from the last batch, below are some of the public-facing activities I have been involved with the past couple of months.